There is a massive amount of gadgets to control and monitor elderly chronic patients without human interaction, and this sometimes makes them feel alone and disconnected from human touch. Once they feel the human interaction is not need to keep them alive, they lose the interest in their own lives, some of them stop treatment or become reluctant to the use of technology. We need to find empathic technology, and pay more attention to this group as life expectancy keeps on increasing in our society. Neurodigital Technologies is a company with a long experience working in Virtual Reality development, particularly on innovative projects for full immersion. Currently they work with Oculus Rift, a virtual reality glasses, and they also have an inhouse developed glove for haptic stimulation which allows people feel touch sensations in virtual reality environments. It could be possible to older people to interact with friends in the virtual world, playing domino, watch their old village, play with a pet they had at child age or visit places they where have never been. Adele Robots has been developing social robots for the last 5 years. 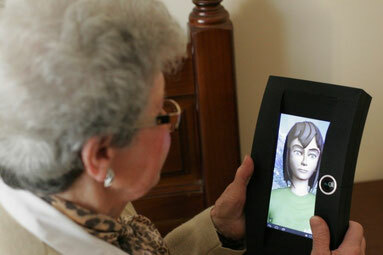 FIONA is a robot companion focused on creating emotional links with elder people. An empathetic character with the ability to understand natural language and detect emotions in their counterpart, to say "Good morning!" or to remind taking medicines, FIONA is the perfect companion for chatting or performing simple tasks, like show photos of grandchildren, video conferencing with relatives or even checking bank accounts. FIONA is able to integrate with home automation systems and fire alarms on predetermined events. Do you have another solution for this requests?